While Yamantaka // Sonic Titan may be the token experimental act on this year's Polaris Music Prize shortlist, they perfectly embodied what ALL CAPS! is all about. 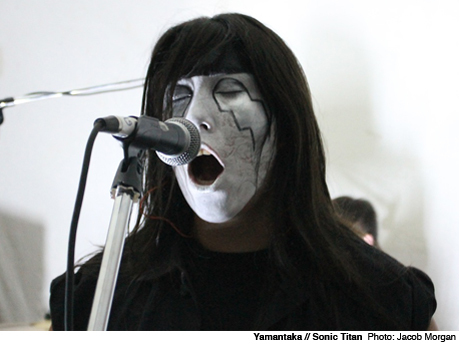 Their artistic vision couples aspects of Japanese and rock'n'roll cultures, the white face paint that masks the band members coming across as a combination of Kiss and geisha makeup and the group describing themselves as "Noh-wave." Separate from the visuals and attitude, musically the band drew from metal and prog for their explosive improvisational sound. They blended tribal chanting, heavy riffs and hypnotic rhythms with sudden bursts of keyboard solos, with this surprising mix of noise and imagery allowing for some horror movie-type spectacles. During an especially mesmerizing drone that had the audience locked in a trance, singer Ange Loft darted into a startled crowd producing all the shock effect of a Hitchcock film. As the headliners of the first night of ALL CAPS!, Yamantaka // Sonic Titan showed why the festival is quickly becoming a premier showcase for creativity and independence in Toronto.